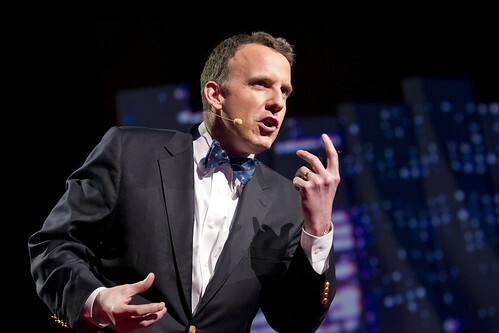 Ed Glaeser is a economist at Harvard, and the author of Triumph of the City, and as his business casual look he wears a bow-tie with ice-cream cones. He is also one of the world’s experts on the nature of cities, and he was invited to set the stage for the TED2012 wish. “At their heart,” he says, “cities are the absence of physical space between people.” And cities are powerhouses of the economy: The three largest metropolitan areas produce 80% of GDP but contain only 13% of population. Glaeser talks about how, in the 19th century, Americans moved into the vast continent, and spread out. In the 21st century we’re moving closer together and taking advangtage of the benefits of being close to each other, and cities are growing tremendously. But if cities in the developed world are growing, that is nothing compared to the growth of cities in the devloping world. All of that decline was because it looked like cities had lost their economic reason for being: Transportation. In the early days of the United States, it cost as much to ship 30 miles over land as to ship across the Atlantic. So cities emerged as nodes on a transportation system. As transportation became cheap, industry fled. Looked like cities were doomed. The other real problem, was urban sprawl. “Each new highway that cut into an urban core reduced the city’s population by about 18% relative to the rest of the area.” Federal government pursued a strategy that ignored the real heart of a city: the people. Infrastructure isn’t what’s needed. The variable that explains which cities came back is human capital: The schools and average education level. The most entrepreneurial place Glaeser has seen is the Dharavi slum in Mumbai. He saw people doing all kinds of creative things, and he marvels at the energy, but he also marveled at the public failures. There are downsides to cities, and cities have been battling them for centuries. Some of these problems need more than just an engineering solution. If you build cars, people will drive. You can’t engineer out of that, you need to do like Singapore, which charges people for congestion. When cities can deal with those problems, they can be incredible and wonderful places to live. Density can cover fixed costs of museums and theaters. With due respect – how wrong you are about villages especially in India. There is greater human to human interaction, human to ecosystem interaction and a vibrant social and cultural life in Indian villages than in towns. There is a struggling but innovative entrepreneurship in the villages – including a late night cafeteria frequented by local youth very similar to “hanging out at the mall!!!! !, florists, barbers, cycle and agri-equipment repair services, doctors, shops, flour mill, in addition to fresh milk and vegetables delivered to your doorstep. Home grown pulses to include pulses, rice, jowar, millets et. . The people living in slums including Dharavi, that you refer to, are no doubt innovative and enterprenual because many are from villages who have been forced to leave their land and livelihood due to years of neglect by governments, the private sector and policy makers. Given the right opportunities in villages, many and in particular women, would never opt for a life in slums in towns. If villages had the attention of policy makers in the way that towns and cities have, Gandhi’s words would indeed be a true reflection of the future of India being in its villages. The idea that cities enable proximity and that supports interactions which result in our “getting smart”, being creative, innovative, and productive is noble; and these things significantly impact any economy. They are also good things if our goal is productivity – either of human capital or of things. It may not be best if we have other goals, such as quality of life concerns. But more to the point…poverty is a thief robbing people of all that would make for anything. It is fueled by hate and that is a problem that must be solved in all environments. The economic structure that supports the rural lifestyle is destroyed by globalization – the global marketplace with interchangeable currencies and rapid transport accompanying affluence. Thus we have the rise of cities. It does not follow that urbanization is the cause of low infant mortality and high income, etc. In fact if 80% of GDP is produced by 13% of the global population, but 50% live in cities, then cities per se are not the cause of affluence. Perhaps we might be better-off living in a million villages close enough together to support self-reliant local marketplaces, enjoying the connectivity facilitated by IT. This seems likely, given everything we see happening, everything we know. I hope Gandhi was right because it seems clear that the future ought to be in villages. All those people struggling to find meaning in the slums of Mumbai might be happier participating in sustainable local marketplaces in villages, and their children would probably be healthier. Meanwhile the slums grow.